Among our types of egg pasta, the hand-stretched ones are the most requested types abroad, thanks to their texture, porosity and perfume of fresh eggs. The slow drying process, which lasts from 24 to 32 hours, and the bronze dies, which give it unique roughness and porosity, make these types of pasta the best choice for a Sunday dish at home with your family, just like people used to do once. Very thin strips of egg dough with a thickness of 1.5 mm. 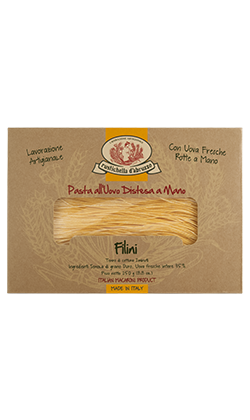 Filini is made with fresh eggs laid by free range hens. It is perfect to enhance seafood dishes with crustaceans and shellfish. It also combines well with more full-bodied condiments such as Rustichella d’Abruzzo ‘ai Funghi Porcini’ sauce with a bit of Rustichella PrimoGrano INTOSSO Extra Virgin Olive Oil. Cooking time: 2 minutes. Linguette is “related” to the famous Genoese Linguine, but with eggs and a more flattened and slightly convex shape. It is perfect with Rustichella d’Abruzzo ‘Pesto alla Genovese’ with a bit of Parmigiano Reggiano cheese and Rustichella organic Extra Virgin Olive Oil. We recommend it also with our ‘Tartufata’. Rustichella d’Abruzzo Nastrini is highly requested by the European market and can be prepared with seafood-based condiments such as scampi, scallops and a bit of mullet’s eggs. Its particular texture and versatility make this type of pasta perfect to combine with stronger sauces, such as our ‘Tartufata’ with truffle slivers, pecorino cheese and a bit of Rustichella d’Abruzzo PrimoGrano INTOSSO monocultivar Extra Virgin Olive Oil. Cooking time: 2 minutes. Pappardelle is just perfect to serve at a table with friends or family. It is similar to Tagliatelle but certainly wider. It rigorously combines with meat-based condiments such as our ‘Salsiccia’ or ‘alla Genovese’ sauces, with a bit of Rustichella d’Abruzzo PrimoGrano INTOSSO Extra Virgin Olive Oil. Cooking time: 2 minutes.